Do you feel bladder pressure and are you daily «burdened» with a unhandy urine bag? MiroValve® makes your daily activities easier. The newest development of the MiroValve® is a revolutionary invention offering a maximum life quality for every patient. Physicians care for their patients prescribe the MiroValve® catheter valve. 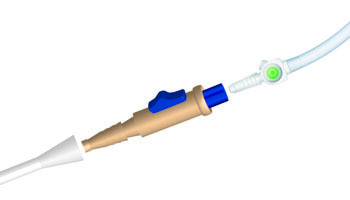 The MiroValve®-catheter valve can be simply operated with one hand. The valve can be easily opened with the slide. Then the bladder can be emptied; to do so, hold one end of the valve above the toilet pan and pull the slide. Further information about the handling can be found in the patient’s info which is enclosed to every valve. 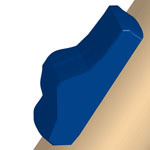 The ergonomically formed slide is suitable for left- and righthanders. The catheter slide is very easy to operate and requires no physical strength. Simply pull it with your thumb in your direction and the valve will open immediately. Urine can drain off easily and fast. Let the slide go and the valve closes on its own… done. The slide has a skid resistant structured surface, which makes it easy to hold and safe to operate. Before using the valve, please notice the instructions attached to every package. You can go to bed without worrying about anything: Simply plug the connector of the urine bag into the blue end of the valve. You do not have to turn, press or unlock anything, since an automatic open mechanism is built in the MiroValve® catheter valve. The valve opens automatically when you connect the urine bag to the valve – you do not have to operate the slide! During the night, while you are asleep, MiroValve® stays open and the urine simply drains off into the urine bag. There is of course an automatic stop mechanism incorporated as well. As soon as you pull the urine bag off the valve it immediately closes automatically. Again without operating the slide, other buttons, locks or anything else. Simply pull off the urine bag: No urine drips onto the floor. Thereby the valve guarantees maximum hygiene for patients as well as the nursing staff. The valve with its modern locking system is patented. The innovative technology is »Made in Germany« and was developed by MiroMed. You find more information, concerning the usage of the valve (for example the nightly usage), in the illustrated patient’s info which is enclosed to every single valve. 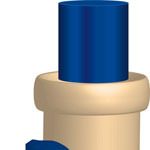 Thanks to the new Mirovalve® all the former catheter stoppers become completely superfluous. No stopper is required anymore since, while pulling off the urine bag, the automatic stopp ends the urine flow. There is a zero chance to dirty bed or clothes with urine and smell is avoided. The rate of infection through uncleanly stored catheter stoppers is clearly reduced. There is also no need to search for the stopper. Simply spray the MiroValve® valve with a medical disinfectant to reduce the risk of infection to a minimum. 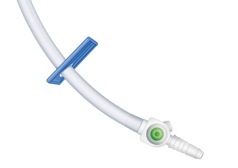 The MiroValve® urine catheter valve is easy to attach between catheter and bag. You simply plug it into the urine catheter; unintentional slipping out is prevented due to the adherent material of the valve. Then you plug the blue end into the urine bag which instantly connects to the valve. You find an illustrated instruction how to connect valve, urine bag and urine catheter enclosed to every valve. The MiroValve® catheter valve can be used with all common long-term catheters and all usual urine bags. It is universally useable. The valve fits the funnel attachment of most popular catheters of national and international manufacturers. Almost all common attachments fit. In this way you are still independent even if someday you should not have a high-quality urine bag system of MiroMed® at hand. MiroValve® guarantees maximum fixation of catheter and bag. Dear patient! To make the usage of a foley catheter easier, we have developed this modern catheter valve. Please read the operating instruction attentively before using the valve. Your MiroMed® team wishes you a fast recovery. To make the usage of a foley catheter easier, we have developed this modern catheter valve. Please read the operating instruction attentively before using the valve. Hold the valve (4) so that you can see the switch. The conical attachment (3) points to you. Strongly press the conical attachment (3) into the funnel attachment (1) at the catheter. The valve is designed to independently stick to the catheter. In order to empty the bladder you hold the front end (5) of the valve above the toilet washbasin or above another receptacle and pull the slidegate valve (4) in the direction of the catheter. After emptying your bladder, let the slidegate valve go (4); the valve closes automatically. 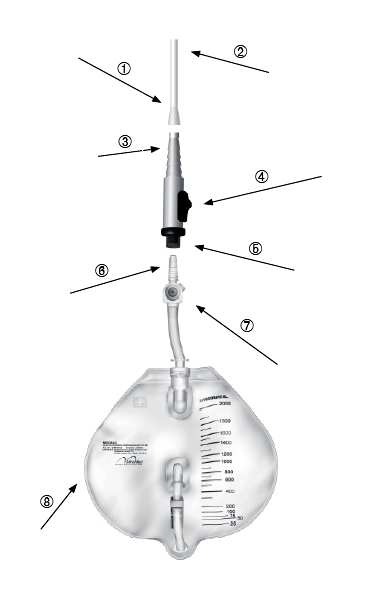 At night you put the conical attachment of the urine bag (6) into the front end (5) of the valve. The special elastic material causes a self bonding. In this position the valve is open and the urine can drain off. Take care that the drain tube (7) is not snapped off. In the morning hold the valve tight at the front end (5) and unplug the connection of the valve (6) to the front valve end (5). The valve closes automatically. Now you can remove the urine bag (8). Hold the valve tight at the front end (5) and unplug the connection of the valve (6) to the front valve end (5). The valve closes automatically. Spray the front valve end (5) with a medical disinfectant and let the means have an effect.Remove the conical attachment of the valve (3) from the funnel attachment as seldom as possible to reduce the risk of a germ colonisation. In the case of preparation for re-use, the physical, chemical and / or biological properties of the product may be altered. * For further questions, please consult your attending doctor. How long can MiroValve® be used and/or which changing intervals are recommended? How is MiroValve® to be cleaned or disinfected? Cleaning and disinfection of MiroValve® is simple and easy to do. In the operating instruction, which is attached to each valve, the cleaning/disinfection is described. You will find the operating instruction here. With which disinfectant can MiroValve® be disinfected? That depends in principle of the designated area of use of the disinfectant/antiseptic spray determined by the manufacturing company in connection with the fields of use the disinfectant became certified for. Please contact the disinfectant manufacturer of your choice. Many patients made good experiences for example with Meliseptol® 250ml spraying disinfectant, which is also available from MiroMed. This is controversially discussed among experts. There are voices refering to Robert Koch Institute (RKI) guidelines, which do not recommend a disconnektion within closed systems. Other specialists share the opinion that the disconnection quite makes sense when desinfection guidelines are considered in order to enhance patients comfort and turn their living circumstances to the better. What we noticed is tha t daily users of incontine nnoying and badly smelling bag. This presupposes however the attention of sterile operation/desinfection guidelines with the connection to and the disconnection from the MiroValve®. The operating instructions refer to that consequently (antiseptic sprayand examination gloves have to be used when connection and disconnection is performed). No. MiroValve® is designed to increase the patient comfort and closes air and liquid-proof. Due to ist design and for technical reasons a bacteria-safe filter inside would make no sense. Disinfection guidelines are always to be considered before and during use. No warranty can be given that infections are prevented. 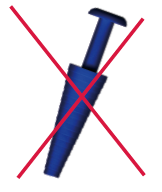 However there is also no warranty with the use of catheter stoppers or other catheter valves. On the contrary: What we noticed is that disinfection rules are much more often ignored when e.g. catheter stoppers are used. Under consideration of risk and benefit for the patient the physician will have to decide whether a catheter valve / MiroValve® can be used in individual cases or not.